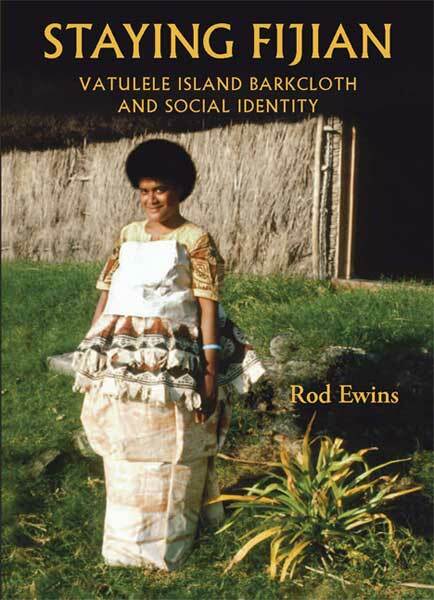 Bark-cloth or masi (generally called tapa by non-Fijians) is the traditional art of the women of Vatulele. While many other Fijian art forms have declined or disappeared, and barkcloth is no longer produced in some places where it once was, and despite its utilitarian functions having been totally usurped by Western cloth and paper, its production on this small island has increased steadily for over forty years. This book looks at the implications of this apparently paradoxical cultural vigour. It is argued that the florescence of barkcloth manufacture cannot be convincingly argued or statistically shown to derive from its commoditisation as a tourist souvenir, the explanation most commonly advanced. Rather, it is shown to reflect an increasing mobilisation of traditional mechanisms of art and ritual to mitigate increasing social and cultural stress, most blatantly evidenced by Fiji’s recent political upheavals. Historical and empirical evidence is produced to show barkcloth as one of the most valued of Fijians’ ritual goods, both as prestation item and as ceremonial trappings. As the most deeply symbolic of women’s goods, it is seen to play a crucial role in maintaining the gender symmetry that defines Fijian cultural mechanisms. Finally, such cultural vigour is shown to be problematic. The increasing demand for their product from other Fijians has profound economic implications for Vatulele, as social and economic roles become intertwined. Traditional gender roles are challenged as women become the principal breadwinners of the entire community, at once empowered and shackled. There are also ecological impacts. Ultimately, however, it is presented as a strong unifying force for a small community facing many local and global challenges. This book places a very local activity in a global context, not only sociologically, but also theoretically. As well as presenting a theoretical and empirical study, it includes a number of photographs of barkcloth production and usage, and relevant ritual, historical and from the author’s own fieldwork. 3. INDIGENOUS ART OR AIRPORT ART? Rod Ewins was born in Fiji, in the fourth generation of an early settler family. With Fijians as his nearest neighbours, he regularly watched women deftly weaving pandanus mats, and recalls the making of a fishing spear as his first formal art lesson, at the age of six. He credits natural aptitude and these experiences equally for his final career as a practising artist (print-maker), university lecturer and administrator. His art has won national and international awards, and is represented in many public collections. Concurrent with his art practice, his lifelong interest in Fijian society, art, language and culture led him to undertake intensive research and seven field trips over the past twenty years, resulting in a number of papers and book chapters, and two books. For more information please visit Rod Ewins' website.